It’s this time of the year: temperatures are rising, Carnival of Cultures Parade is marching, Streetfest is bubbeling – Kreuzberg is celebrating the Carnival of Cultures 2014. This year I am again not actively taking part in Carnival of Cultures and the related open air / street party – but of course one somehow can not avoid the festival feeling when traveling to / through Kreuzberg this weekend. All weekend U-Bahn line U1 is packed with party people of all ages and origins. Many people are dressed up for the special occasion, some are even wearing costumes. Everything is ok, everything is fine. From Friday till Monday the street fest near U-Bahn station Hallesches Tor is the hot spot. Four stages (Bazaár Berlin, Eurasia, Farafina & Latinauta) offer live music from all around the world – all day – all for free. And over 300 booths invite you for a special snack. I made it to a friend’s balcony and took this photo. What you can see is the U-Bahn Station Hallesches Tor, probably “THE” station this weekend. 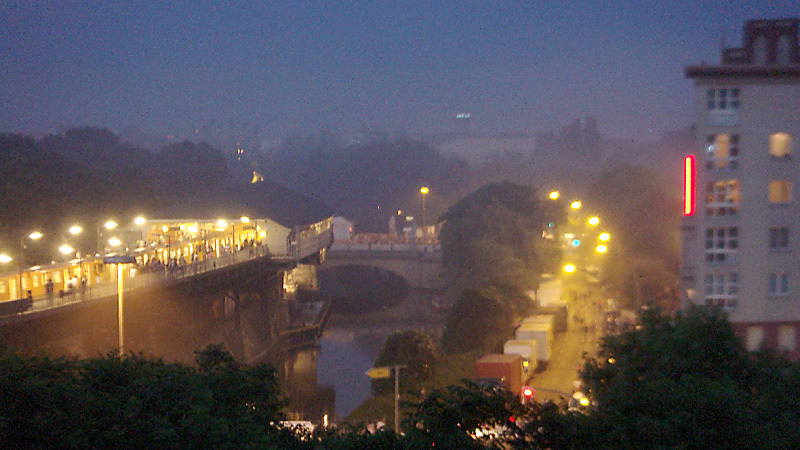 And you can see the ‘fog’ – or actually it is smoke – that probably comes from dozends, if not hundrets of mini grills. Greatness. Bon appetit!